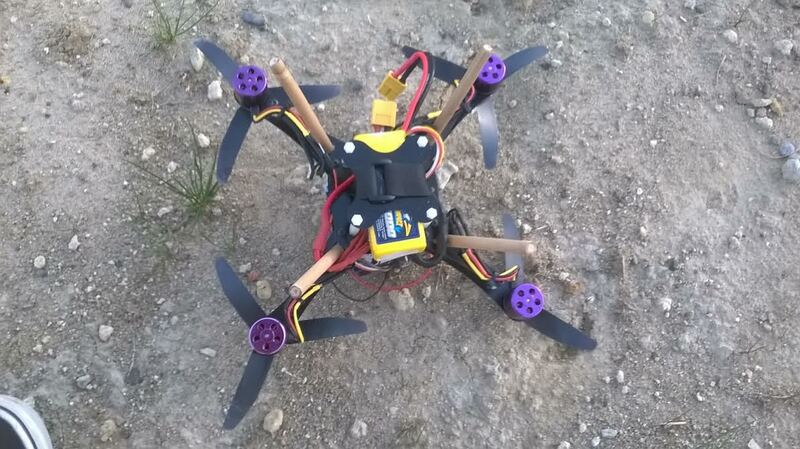 Here are all my posts about my quadcopter project. After a lot of problems and a lot of failed attempts with my DIY controller, I decided to buy one to understand what’s wrong (and also to make it fly !). I decided to buy the Flip32 (AfroFlight NAze32) because it was based on Arduino (MultiWii) and it seems to have a lot of interesting features (magnetometer and barometer, battery monitoring , possibility to implement ultrasound sonar …). It was also the occasion to discover a sensor that I’ve never used before the barometer. I know how it works in aviation (it is what is used to know our “altitude”). However I was astonished to see how precise it is ! It can detect variation of a couple of centimeters vertically only with atmospheric pressure. For only 29€, I bought it in order to see if it could make my drone fly. Right now it is flying in gyro mode but the stability is not great ( so a card is not that much better than me :P). However with a card it is easier to have physical vibration damping which is the next step. I’ll try to experiment a lot with this new card, but I’ve not given up the homemade controller. I’m still working on my quadcopter with a DIY flight controller based on an arduino chip. After a lot of tests and mainly (to not say only) crashes I realised that my gyroscope datas were unstable, here is how i try to sort it out ! In a previous article, I explained why we need a gyroscope and an accelerometer on a quadcopter to determine its attitude (pitch, roll and maybe yaw). In this article, I will explain how to filter the raw datas coming from the gyroscope in order to use in a fusing algorithm. yet an other crash ! The drone was not moving so what you see is only noise. The value is supposed to be 0 on each axis. When you see this graph, you quickly realize that each axis is staying around a specific value, this is the offset. Sensors are not perfect and their zero is not the real zero. The values are simply the result of an average of 500 values on each axis. The result is better but we still have noise. 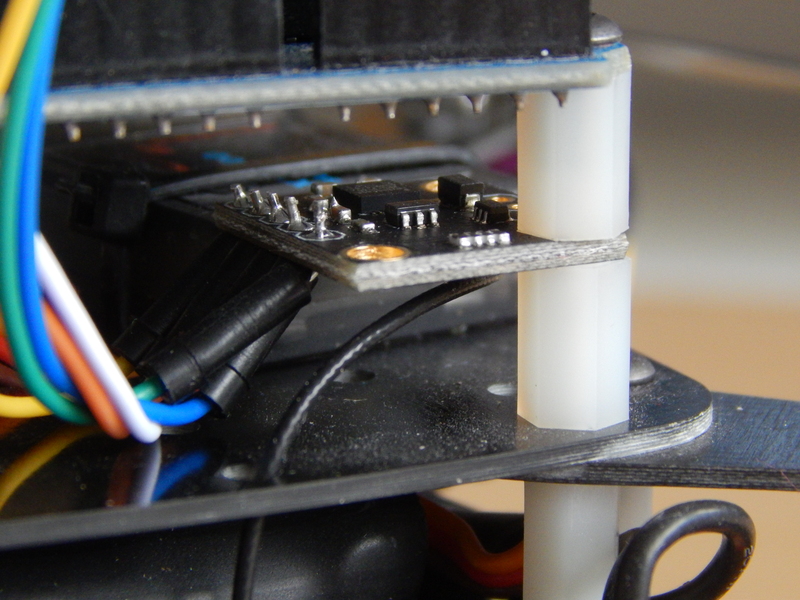 This is a simple solution that can only apply to my sensor at this specific time. The offset can move and is different from one sensor to an other. A more complex way would be to calibrate it at the beginning of each flight. There is noise in the reading, not only because of the sensor itself but also because there are a lot of vibrations on board ! With my tests I realized that the motors tend to change the reading from my gyroscope. This is what you can see on the next graph, when the motors are not turning there is almost no noise, however when the motors are spinning there is way more noise that needs to be filtered. 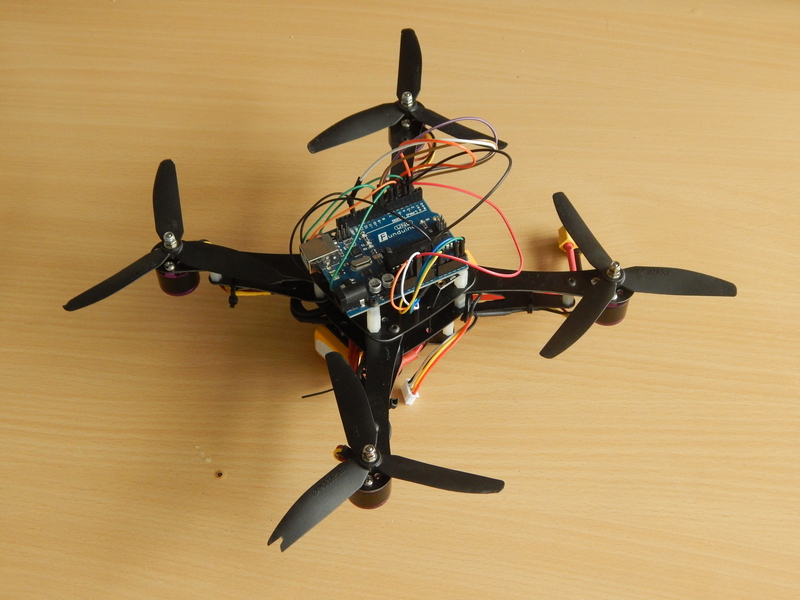 In my previous article about my quadcopter, I described my project. Now comes the first step where I explain how to get pitch, roll and yaw information from my inertial measurement unit (IMU) on my Arduino card. For this part, I will be only using the accelerometer and the gyroscope of my MPU9150 (so it’s the same as a MPU6150). We’ll first see why we need both an accelerometer and a gyroscope, then I’ll give you my wiring and finally I will talk quickly about the fusion algorithm. Why do we need accelerometer AND gyroscope ? To answer to this question, you need to understand what kind of information is given by the accelerometer and the gyroscope. The accelerometer will measure acceleration, and in our case we are interested by the acceleration caused by gravity. If your sensor is not moving it will give you a 3D vector pointing at the ground, so you can know your attitude (pitch, roll and yaw). This is what is used in your smartphone to rotate what is displayed on your screen when you tilt your phone. Unfortunately, an accelerometer is sensible to movement and vibrations which are two elements that you have on a drone so you can’t use it alone. The gyroscope will measure an angle velocity on every axis. By integrating this, you will be able to know what is your attitude. But you have to know your first attitude at the beginning (either by starting on a known position or by using data from another system like an accelerometer of course !). The gyroscope comes with another problem : it tends to drift over time so you need to reset its position from time to time. You can see that the accelerometer is noisy and that the gyroscope drift at the end. The point of a fusion algorithm is to get the advantages of both sensors in order to have a nice attitude indication.